No one would argue that working out of an office allows you to do your job more efficiently. 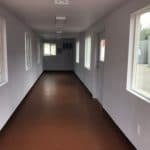 But being able to enclose yourself in a private space so you can focus on your work isn’t always easy to do at construction sites or other industries that typically make use of shipping container offices. Whatever your industry is, one thing is for certain: efficiency is of the utmost importance to achieving a good day’s work. Here’s what you need to ensure you’re working at maximum efficiency in your shipping container office. Everyone has their ideal working conditions, a set of personal factors and preferences that allows them to work more productively. Chief among these is temperature. Being able to control how hot or how cold your portable office is will depend on not only the current season but how you’re feeling during a typical eight-hour (or longer!) shift. 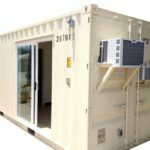 Installing HVAC in your shipping container office puts comfort at your fingertips, allowing you to raise or lower the degrees as you need, so you’re never distracted from your work by being too hot or too cold. Apart from HVAC, installing proper insulation can also ensure efficient climate control for your portable office unit, as it will retain heat and air conditioning more easily. Wiring electrical power into an office can be tricky. You should have an idea of where you want the electrical outlets and switches to be, as well as the fuse box, and how much space you’ll need to run your cables. You will also need to consider what you’ll be using the electricity for; sufficient voltage will be required to power your electronics, lighting, and any other devices necessary to do your job. Your worksite likely has public or portable restrooms that you can use whenever nature calls. 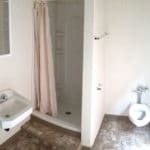 However, having a bathroom built right into your mobile office can simply save you time. With a personal bathroom that includes a toilet, sink, or even a shower, there’s no need to spend precious work minutes waiting for an open stall. 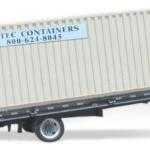 Bear in mind that you will need water hookups installed into your shipping container office to allow for plumbing, but the effort is well worth the extra convenience. You will need to maintain adequate air flow if you plan to spend any amount of time in your shipping container office. That’s why you’ll need to consider adding vents to your mobile office. Like you did with your electricity layout, plan to know where you’ll have the vents cut beforehand; the last thing you want is to have your vents covered up by cabinets, desks, or other potential obstructions. Another added advantage of windows is that they grant you a view of the outside world. While hunkering down can be great for productivity, studies show that taking breaks to gaze at nature can actually boost your creativity, helping you actually be more productive in the long run. So while the air conditioning serves to cool you down, don’t take for granted the feeling of a cool breeze! These days, adapting to new (and sometimes unforeseen) circumstances is a necessity for those in any line of work. 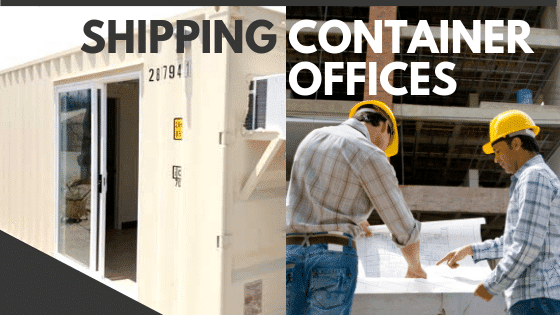 Adding mobility to your shipping container office can help you easily meet these situations, enabling you to move your worksite to a new location. 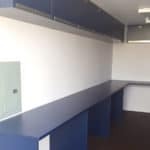 Taking advantage of a portable office allows you to set up at multiple worksites throughout the year, saving time and money, or the flexibility to move your unit to a more efficient space. Is there something else you want added to your shipping container office? Let us know! We’d be happy to help you design your ideal working space.